Create the cozy bedroom of your dreams with this simple DIY upholstery job—all for less than $100. Whether sleek or tufted, upholstered headboards consistently complete the look and feel of the basic bedroom. 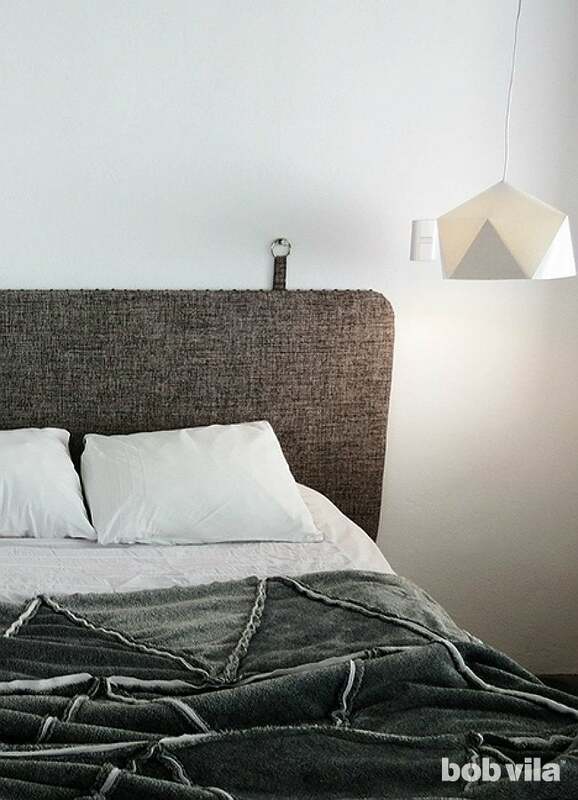 The shape and texture create a focal point at the head of the bed, while the soft fabric itself adds an extra layer of “cozy” to the resting space. Similarly, it’s a near guarantee that these bedroom furnishings can sell for more than your entire bedding set combined, sometimes as much as the mattress! Even simple, minimalist designs cost hundreds of dollars—but not so when you do it yourself. 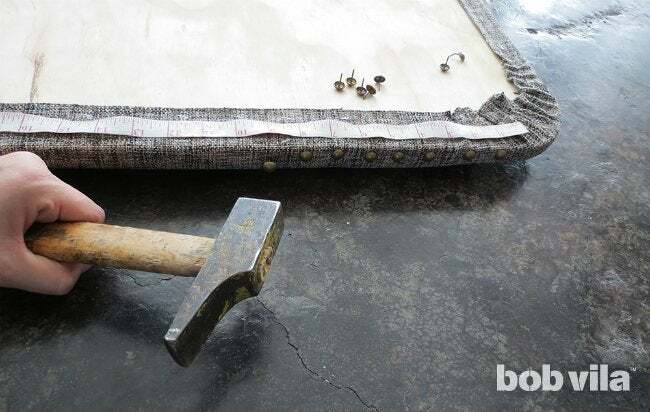 The materials for this particular DIY upholstered headboard ring up at a fraction of the cost of similar options sold today, and won’t eat up valuable time, either. In just one afternoon, you can craft an upholstered headboard that captures your own unique style while still keeping to a budget. When you pick up plywood from your hardware store, ask the employees to cut it to the size you need—most big-box stores will. To hang out past a 76-inch-wide king size bed, we made those dimensions 96 inches long by 32 inches high. Smaller than that, you’ll reduce the length but always keep the height at 32 inches. 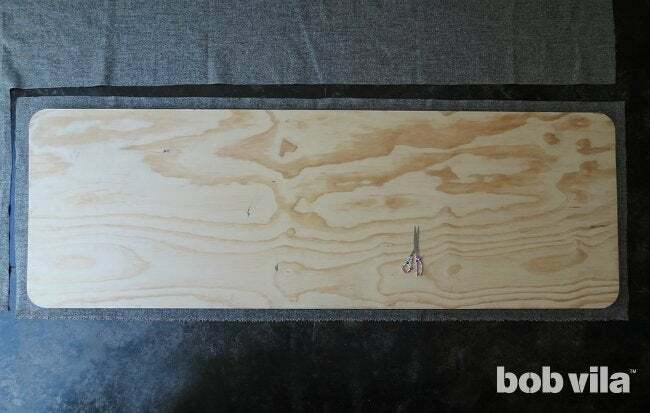 Once you have the plywood board cut to the dimensions that best fit your bed, you can round the corners on your own. 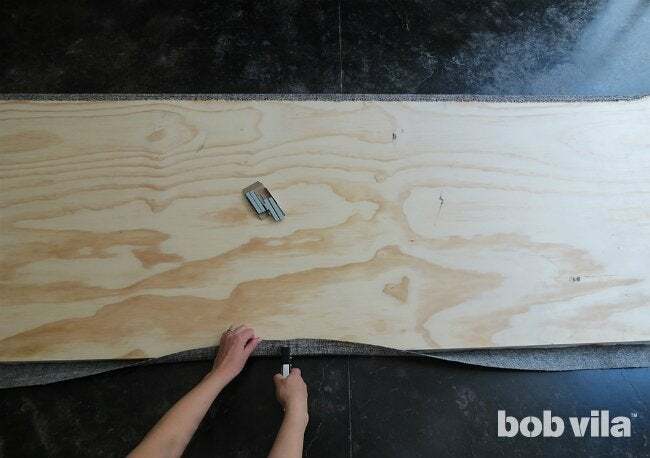 Position a plate or a circular lid in one corner of the soon-to-be DIY upholstered headboard and trace it edge. Cut out the quarter of the circle nearest the corner with the jigsaw so that you’re left with a rounded corner, and sand the edge to remove the splinters. Repeat for each corner. Cut a piece of quilt batting roughly large enough to cover the whole plywood headboard. 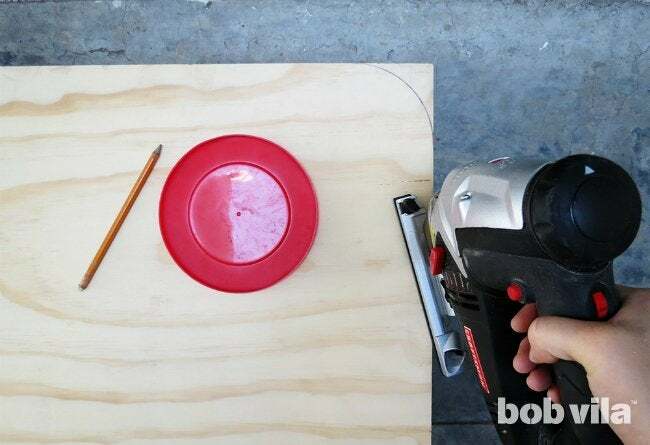 Stick it onto one side of the plywood using a glue gun. 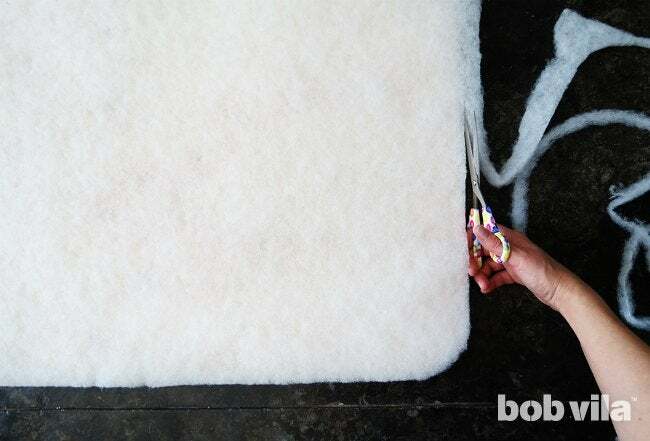 If you want it to be extra plump, you might consider doubling the amount of wadding used by cutting a second sheet and gluing between the layers. Once the glue is dry, trim the batting closer to the shape and dimensions of your headboard and glue its edges to the edge of your plywood. Flip the board so that the batting faces down, and place it on top of upholstery fabric of your choice. Trace the board’s shape onto the fabric in marker, leaving space for an extra 3 inches of fabric all around. You don’t want to cut the fabric too short, since that extra length will wrap around the edge of the headboard and attach at the back. 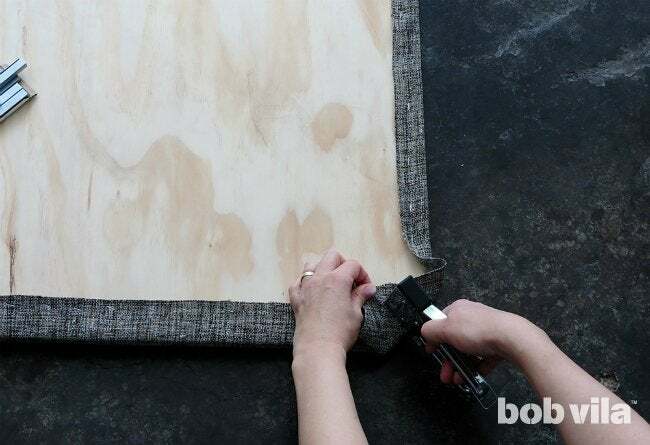 Without moving the board around on the upholstery fabric too much, pull the fabric around one side of the plywood and fasten it to the back using a staple gun and 8 mm staples. It’s best to fasten one side and then work on the side opposite it, rather than working clockwise or counterclockwise around the board. 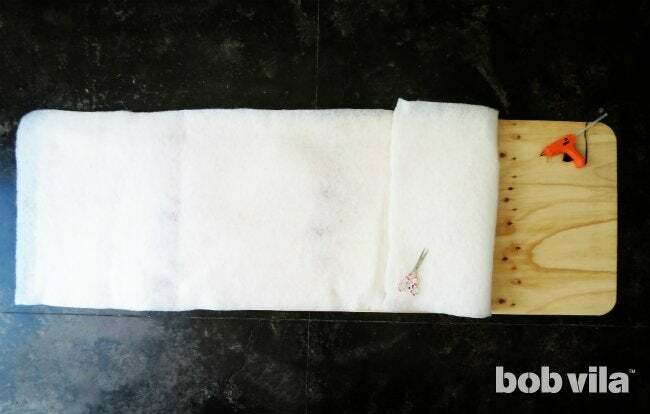 That way, after your staple down the left side, you can lightly stretch the fabric across the front of the headboard and wrap it around the right side so that the fabric is taut. Use enough staples to hold firmly the fabric; one every 2 to 3 inches is a good rule of thumb. Save the corners for last. 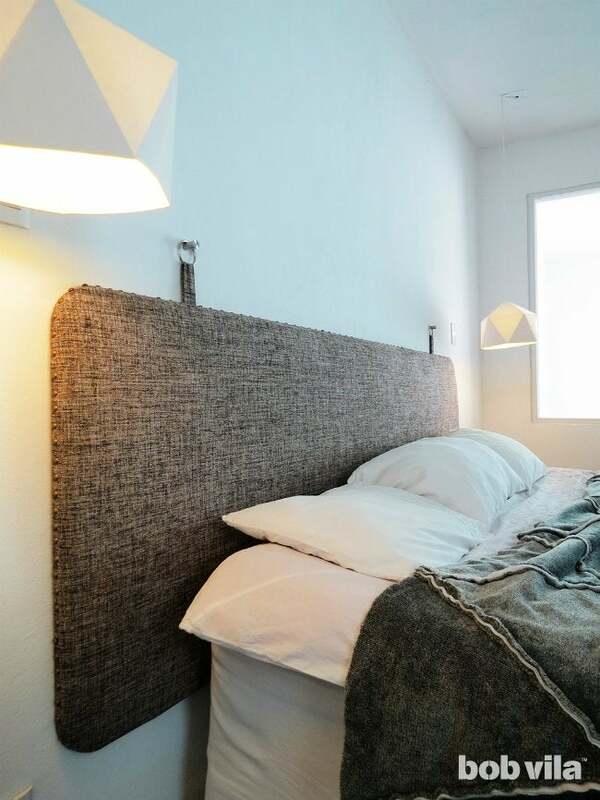 Pull the very bottom right corner of fabric over the back of the headboard and staple it to the plywood. Then make small folds in towards the middle of the corner on either side in order to keep the round shape, stapling each as you go. You will use more staples to fix the fabric on the corner than for the sides. Repeat on the other three corners. 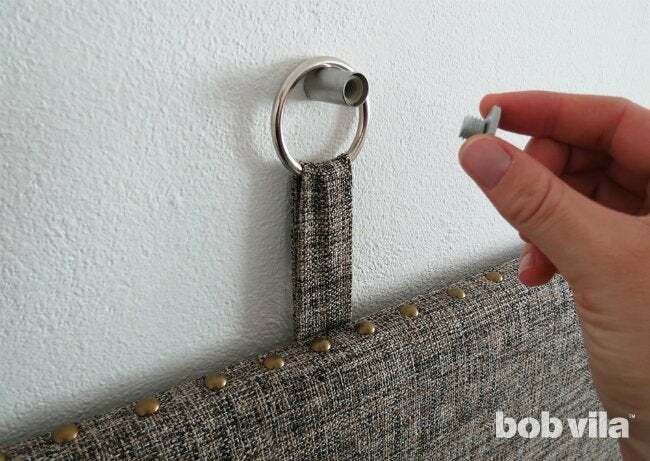 To easily add an elegant finish to your DIY upholstered headboard, hammer furnishing nails along its edges. Lay a ruler along the board side to help you space nails only 1 inch apart from each other (you may even indicate where to add them in marker). Then tap each individual furnishing nail into place, according to the instructions on the packaging. 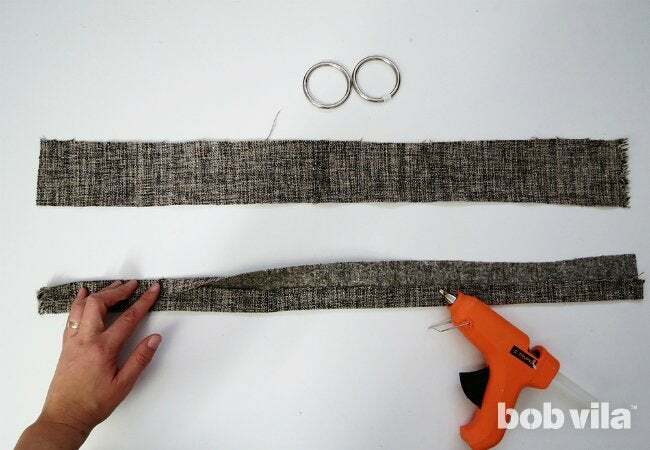 Cut two fabric strips from your upholstery fabric scraps, each 30 inches long by 4 inches wide. Using a ruler, draw a line down the exact middle lengthwise (2 inches in) on each. Apply hot glue to each 30-inch edge on the first strip, and fold them in to meet at the middle where you’ve just drawn this line. Press and hold until the glue cools completely to keep the fold. Repeat with the second strip so that you have two doubled-up strips that are 30 inches long by 2 inches wide. Pass each strip through its own 2-inch metal ring, and fold it in half so that the ring is at the center. 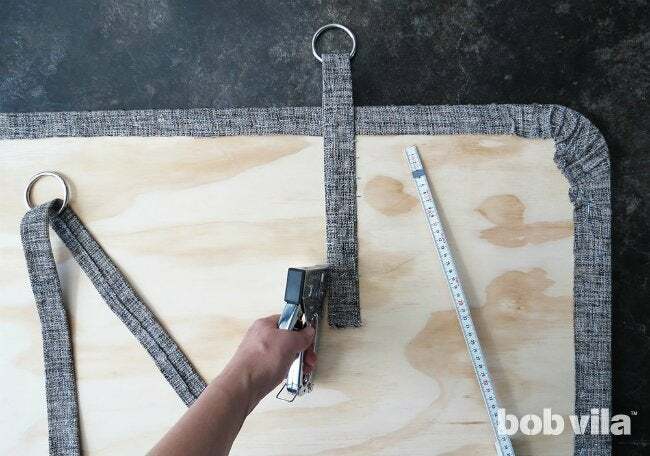 Now, on the board, measure 12 inches from the top and 12 inches from the right edge to position and staple down the loose ends on the first folded strip. (Hint: You should still have about 3 inches of length hanging past the top edge.) Repeat with the second strip, this time 12 inches from the top and 12 inches from the left side. 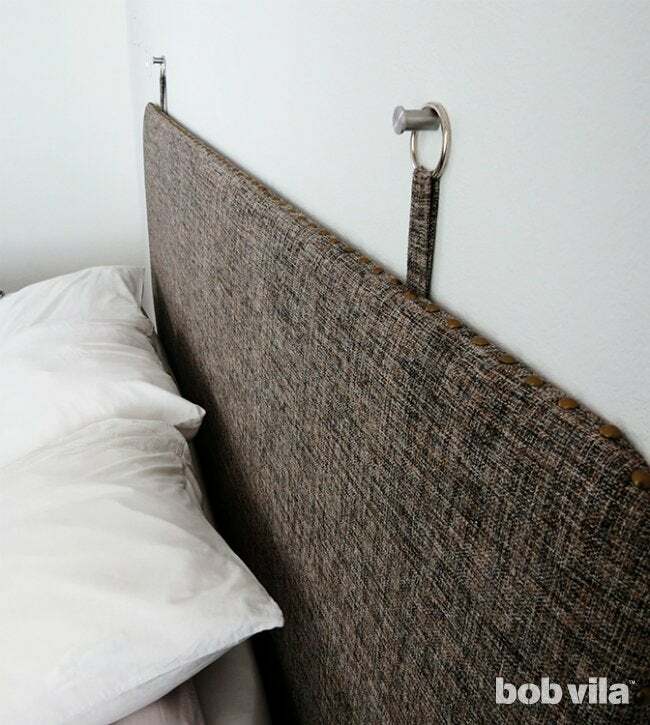 Don’t hesitate to use a lot of staples here, as these strips will be how you hang up your DIY upholstered headboard. 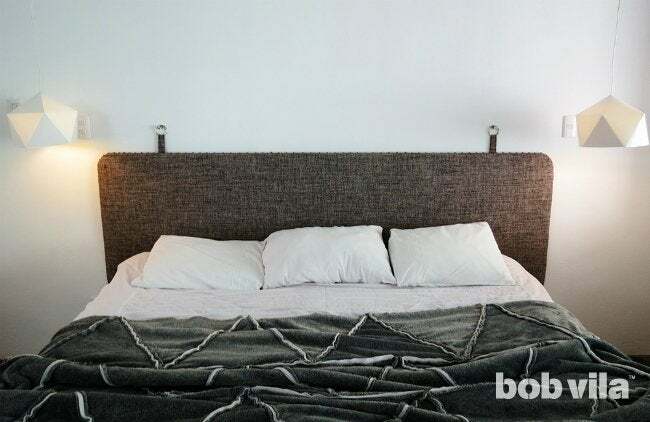 Finally, move your bed aside and prepare to hang the DIY upholstered headboard on your bedroom wall by first mounting two decorative drawer knobs (either cabinet or small dresser knobs work nicely) for the rings to slip over. Since most knobs require rear-mount installation and you cannot access the space behind the wall, you’ll have to swap out the screws that come with the knobs for dowel screws twice the length but the same width. If you’re not mounting your headboard directly to wall studs, consider installing drywall anchors first to offer extra support. Otherwise, pre-drill holes into the wall at each location and twist in your dowel screws. Then, hang your DIY upholstered headboard over the exposed ends of the screws and cap each screw with the decorative round knobs. All that’s left to do is push your bed back in place—we won’t judge if you decide to call it a day after this statement-making DIY! Your work here is done. 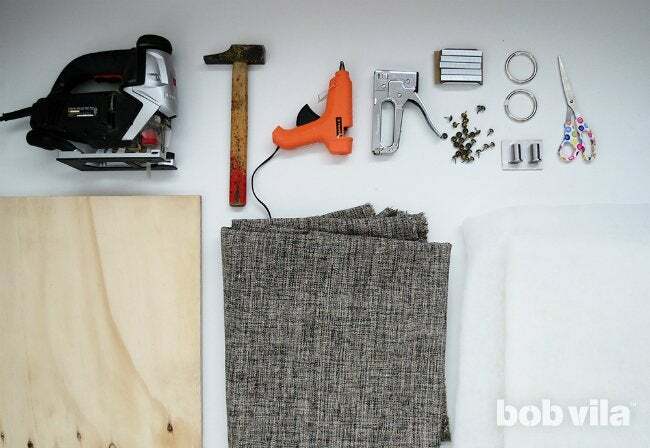 Ama is a DIY addict and the creative mind behind Ohoh Blog. She likes home decor, lighting, and furniture projects that may involve painting, sewing, drilling…no matter the technique! Whatever she has on hand is inspiration to create, and fodder for her serious addiction to upcycling.